The Network in Solidarity with the People of Guatemala (NISGUA) works to build and strengthen ties between the people of the United States and Guatemala in the global struggle for justice, human dignity, and respect for the Earth. NISGUA accomplishes this through an integrated strategy of international human rights accompaniment, digital organizing, strategic campaigns, political education, and horizontal exchange. With over 36 years of experience, four staff, and two offices in Oakland, CA and Guatemala City, NISGUA’s work creates lasting change by cultivating long-term relationships grounded in mutual trust and shared struggle. 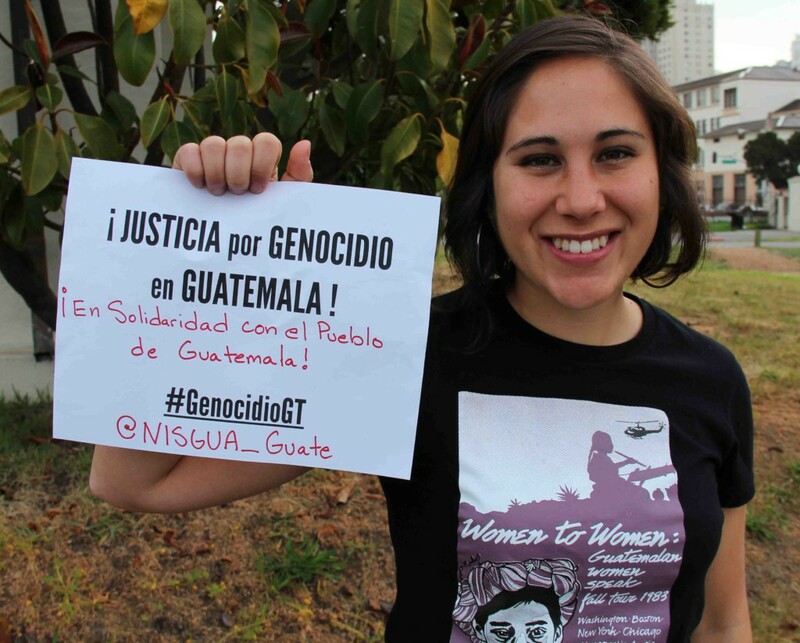 NISGUA works for real democracy in Guatemala and the U.S. and strengthens the global movement for justice. NISGUA builds mutually beneficial grassroots ties between the people of the U.S. and Guatemala and advocates for grassroots alternatives to challenge elite power structures and oppressive U.S. economic and foreign policy. To achieve our mission, NISGUA distills information, analysis, and perspectives from Guatemalan grassroots organizations and NGOs, and channels them to activists across the U.S., to sister advocacy organizations, and to Congressional offices and the press. We design and organize U.S. grassroots advocacy campaigns in response to the needs on the ground, and where it is strategic for NISGUA to play a role. Through annual Guatemalan speakers tours and on-the-ground support to delegations to Guatemala, we build U.S. understanding of the challenges facing the Guatemalan people, help build the “spokesperson” capacity of our Guatemalan partner organizations, and strengthen people-to-people ties across borders. For nearly four decades, NISGUA has been one of the primary organizations linking struggles for justice between the U.S. and Guatemala. We formed in 1981 to coordinate U.S. activism to fight state support for Guatemala’s brutal military regime. In 1981 alone, the U.S.-sponsored military government killed or disappeared 19,000 civilians. The situation in Guatemala and the U.S. has changed since 1981, but NISGUA is still one of the strongest grassroots organizations working for justice, human dignity, and respect for the Earth by centering Indigenous and campesino peoples’ struggles, from Guatemala to the U.S.
Amanda Kistler chairs the NISGUA Board of Directors, which she joined in 2011. She worked as a human rights accompanier in 2008-2009, serving one year in Rabinal, Baja Verapaz, and a second based out of Guatemala City. Amanda grew up in the Needham Sponsoring Community, has served on GAP Council, and continues to organize with NISGUA locally in the Washington, DC area. Amanda directs Communications and Development at the Center for International Environmental Law (CIEL) in Washington, DC, where she has worked since 2010. Amanda has also coordinated CIEL’s international campaigns in support of indigenous and campesino communities defending their rights against large-scale mining projects throughout Latin America. Jillian Tuck joined the NISGUA board in 2014, and currently serves as its secretary. Her involvement with NISGUA began in 2006 when she worked as a human rights accompanier in Rabinal. She’s played multiple roles since then– serving on GAP Council, organizing speaking tours, and participating in the Guatemala News and Information Bureau sponsoring committee. Jillian currently lives in Bangkok, Thailand, where she works to bring laws into compliance with human rights standards and supports grassroots organizations in accessing philanthropic spaces. Phil Neff has been a member of the NISGUA board since 2016. He first served as a human rights accompanier in the Ixcán during 2008, and joined the NISGUA staff as Accompaniment Coordinator during 2010-2012. Phil lives in Seattle, where he has organized various NISGUA speaking tours and events. He works as Project Coordinator for the University of Washington Center for Human Rights. Cat Norris joined the NISGUA board in 2014. She served as an accompanier with GAP in the Ixil in 2005 and as a member of NISGUA staff 2005-2007. Cat lives in San Antonio, TX with her family, including two small children. When she’s not occupied with little people, she works as an immigration attorney with Texas RioGrande Legal Aid, assisting folks in both removal proceedings and affirmative immigration matters. Jerry Kohler is the treasurer of NISGUA, joining the board in 2011. He is a semi-retired CPA with the career experience of owning a small accounting firm and then moving to full-time teaching of accounting at the community college level. His daughter, Kim, was an accompanier for NISGUA from 2006-2008. He currently resides in Santa Rosa, CA. In 2018, NISGUA created opportunities for horizontal exchange, for political education, and for growing into a lifelong commitment to organizing for a just world. This year, as communities faced heightened repression in both Guatemala and the U.S., we grounded in our conviction that we can mutually strengthen global struggles for liberation by sharing collected wisdom and resources across borders. Through grassroots gatherings, international accompaniment, actions, and advocacy, our network created opportunities for exchange and mutual support. In the coming year, we will continue to educate, organize, and advocate for changes demanded by Guatemalan Indigenous and campesino leaders. We will connect movements in the US and Guatemala around the issues that affect both. We will create opportunities for organizers to gain the skills for a lifetime of globally-informed activism. Will you join us? Click here to read more about our 2018 Accomplishments.